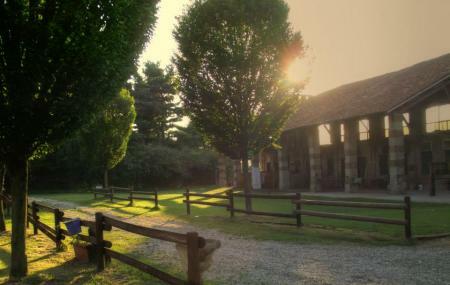 Find hotel near Cascina Bruciata-contea D ..
Cascina Bruciata-contea Del Sole is a beautiful fresh countryside with horses and other friendly animals, and a club. An ideal place to celebrate special occasions, host events, throw parties and conduct country dance festivals. The environment is so fresh and pure, and the atmosphere lively as well as peaceful. Away from the city, this place is an enjoyable weekend destination. To personalise your visit to the city, you can use an all-inclusive Landriano trip planner for the same that will give detailed information about visiting the city. You won't miss your home when in Landriano, hotels in Landriano like Hotel Ristorante Italia, Hotel Riz, Hotel Alga and Hotel Forum offer some of the best places to stay in the city. Choose from variety of exclusive Landriano vacation packages for your next visit or create own own. Check out the various options for how to reach Landriano and finish off your vacation package by booking the ideal transfer. Love this? Explore the entire list of places to visit in Landriano before you plan your trip. Fancy a good night's sleep after a tiring day? Check out where to stay in Landriano and book an accommodation of your choice. Esperienza Fantastica da ritornare, la prossima volta equitazione!